Nigeria's well respected disco jockey, DJ Consequence was in charge and rocked last night's Big Brother Naija party with the housemates. Just as it's been happening for the past 8 weeks, the Housemates turned up and brought the House down. The past 8 weeks have had the Housemates turning up without fail thanks to Biggie’s on par invitee DJs. From personalised remixes to Housemates features, the parties have brought a kind of confidence and reassurance that the Housemates need ant tonight wasn’t any different. After being occupied for the greater part of the day thanks to their Flex Condom Task, the Housemates had very little time to psychologically align and prepare themselves for what the evening brought but when signalled, they quickly jumped to the store room, excited to see what was enclosed in the Payporte bags and as per usual, they weren’t failed. Following the modern theme, the Housemates’ outfits were nothing short of funky and fashionably relevant. From funky platformed shoes to muscle tight jackets and backside hugging shorts, the day’s outfits certainly deserved a place on the epic hall of fame. As always, they Housemates couldn’t hide their excitement and dove right into their party preps. 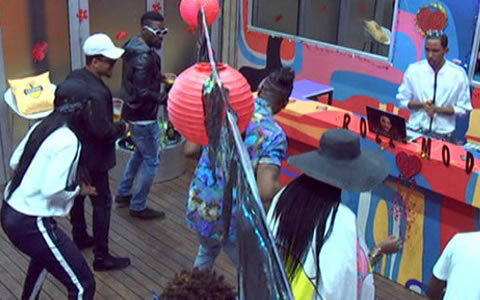 Face beats and toxically perfumed, they graced the mirrors, ensuring that their dance moves wouldn’t compete with their steezes and thanks to Biggie’s in-House stereos, the Housemates got a feel of how epic the evening would be and so it began. Dj consequence didn’t hold anything back. Thanks to his personalised ‘this is Big Brother…” the Housemates felt very relevant and that alone fuelled and brought out their inner party animals. As always, Alex played ring leader and had the other Housemates trying their hardest to stay in synch. Despite his inability to correctly follow the rhythm, Rico Swavey danced along anyway, noth giving anything away. Toracle (Tobi and Miracle) brought their best moves and further blazed a trail of rhythmic excellence, making the beat that much more intoxicating. Overall, the party was lit and so were the Housemates.